Lewis Wharf where the Provincetown Players produced their second evening of plays in 1915. Note the rather pronounced slant to the left. On this day in theatre history–July 15, 1915–the famed Provincetown Players was founded when a group of bohemian artists, writers, and poets vacationing on Cape Cod gathered on the veranda of a house in Provincetown, Massachusetts, to perform two original plays written by friends. The house was an ocean-front rental occupied that summer by Harvard-educated journalist, author, and anarchist Hutchins Hapgood and his wife Neith Boyce, novelist and playwright. In fact, it was Boyce’s play, Constancy, that opened the evening, followed by Suppressed Desires, a short work co-authored by the husband-and-wife team of George Cram Cook and Susan Glaspell. Two sets were quickly thrown together by another summer resident, Robert Edmund Jones (already one of the most famous practitioners of the “New Stagecraft”)–one set, according to Jones’ notes, facing the ocean and another facing the living room. The bill was so popular that friends demanded another showing. And so Cook organized a more complete evening of plays presented a few weeks later in a makeshift theatre on a wharf owned by journalist, labor activist and novelist, Mary Heaton Vorse–what would become the iconic imagine now most associated with the Provincetown Players. There is no doubt that the group was directly inspired by the radical European avant-garde movements (something many had only first experienced during the 1913 Armory Show in New York) and the need, as they saw it, to reinvigorate a moribund American theatre. As a result, few theatre professionals were asked to join the group initially, believing that the influence of commercial theatre types would inhibit their purpose. Over the winter, Cook and Glaspell recruited more writers and amateur performers from their circle of friends in Greenwich Village. 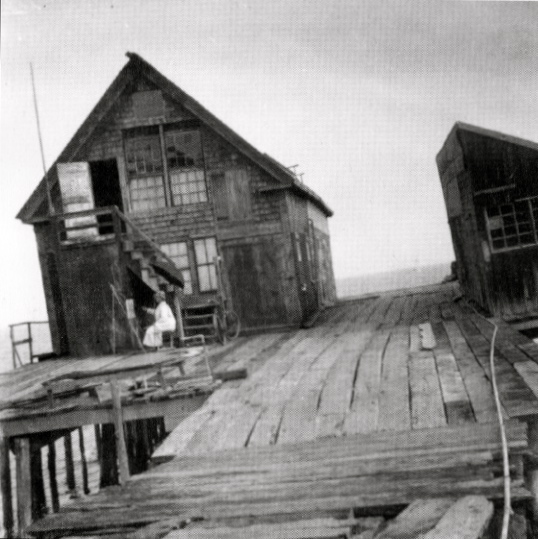 By 1916, the summer trek to Provincetown included some of the best known radical thinkers, poets, writers and artists of the post-Armory Show age–John Reed, Louise Bryant, Marsden Hartley, William & Marguerite Zorach, Harry Kemp, Max Eastman, Ida Rauh Floyd Dell, and, of course, Eugene O’Nell, whose Bound East for Cardiff was the first of his plays produced by the group. In the fall of 1916, Cook and Reed moved the company to New York City and continued to produce an extraordinary list of new works by innovative and radical American writers in a non-commercial environment until the company folded in 1929. Apart from O’Neill, the company introduced an unprecidented number of great new playwrights and theatre artists to the American stage–some who might have never been produced otherwise–including Edna St. Vincent Millay, Donald Oenslager, Kenneth Macgowan, and Paul Green. This entry was posted in Twentieth Century, Uncategorized. Bookmark the permalink.